Rooftop gardens, a 200-seat auditorium, kitchenettes and living rooms. These are the new amenities students living on the University of Miami’s Coral Gables campus will have access to upon the completion of a 10-year housing project set to begin later this year. The university will embark on a process to create enhanced, community-based residential housing spaces that meet the expressed needs of students. The project comes after almost five years of surveying students and parents and conducting focus groups, Vice President for Student Affairs Patricia Whitely said. “We certainly listened to what they wanted: apartments, suites, places to cook, not being on a meal plan, et cetera,” Whitely said. The project will be divided into three phases over the course of a decade. 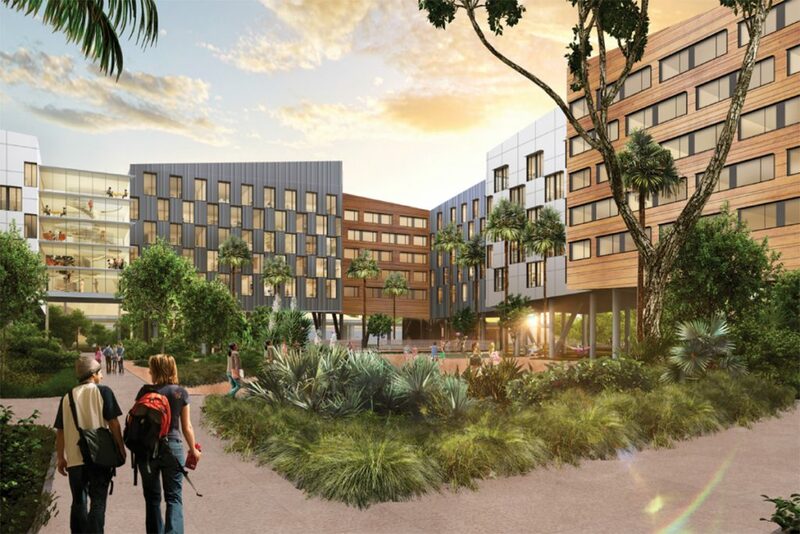 The first phase includes constructing a $155-million living complex for sophomores, juniors and seniors, to be built on a space that is now parking lots between Lake Osceola and Stanford Drive. UM has submitted a proposal to the City of Coral Gables for the construction of the 8.6-acre village, to be composed of 25 clusters of interconnected buildings. In the areas between the buildings will be a space for a courtyard and lawn facing Lake Osceola, according to the letter of intent in the Development Review Committee Application given to the city. Designed as a “hub for student life and campus-based activity,” the compound will encompass a learning center, a Launch Pad for student start-up businesses (to replace the one in the University Center), an auditorium, a bike shop and a recreation room. According to Executive Director of Housing and Residential Life (HRL) James Smart, the new residential college will be able to accommodate the high demand of students trying to live on campus. Smart said the university currently has a total of about 4,300 beds. As of fall 2016, 4,048 of the school’s 10,615 undergraduate students live in on-campus housing, according to university data. In past years, the school has been unable to fulfill all of the requests from students to live on campus and ended up temporarily housing the overflow of students at the Holiday Inn on US-1 across the street. Since the housing program runs on students’ room and board fees, Smart said the students will have to pay more to live in the new housing but did not say how much. Whitely and Smart said tuition will not increase because of the project. For Braylond Howard, a junior who has been staying on campus since his freshman year, living in Pearson Residential College is more financially feasible than living off campus, where rent for surrounding apartments can cost thousands each month. Howard said he doesn’t mind living on campus, even if the dorms are older, but thinks the new developments are needed to keep UM competitive compared to other Florida schools. Upon completion of the first phase of the project, there will be 1,104 additional beds on campus. Smart said these new beds will allow UM to begin the next phase: demolishing Stanford and Hecht, the two existing freshman dorms, which were built in 1968. The two 12-story towers will be replaced by four new buildings, a separate housing project, intended to house freshmen. The original plan for the construction of the freshmen dorms was unveiled at a Student Government meeting in 2015. At that time, construction was expected to start in summer 2016. The newer dorms will have features addressing safety concerns of the stairwells in the current buildings. The staircases in the towers contain open-air breezeways between every level, causing worries about the security of students in cases of storms and hurricanes. Smart said the new buildings will be constructed with interior “monumental staircases” – similar to the Shalala Student Center’s – that spiral over a series of study lounges, and will be equipped with “vertical wire screens” to prevent students from throwing objects or falling off the staircase, problems the university faced in the past. “It’s a much more secure environment and much more safe environment than some of the designs we’ve had in the past,” Smart said. The last part of the project will be the renovation of Mahoney-Pearson and Eaton Residential Colleges. These buildings are considered historic architectural structures by Coral Gables and therefore must remain the same on the exterior but will be gutted and remodeled to include new room layout styles. Apart from the traditional single and double suite layouts, students will also have the option of choosing full suites that will include living rooms and kitchenettes. Whitely and Smart said the new changes are a result of not only the surveys taken from students regarding amenities they were looking for in their housing units but also surveys with student leaders, including residential assistants and members of Student Government. Student Government Treasurer Morgan Owens was a committee member of the Building and Grounds Committee created by the university to provide suggestions for the project. Student Government President Vikesh Patel, who also contributed to his input, said he was personally excited for future students who will be able to enjoy the school’s new facilities. Whitely said the university wants to begin the construction of the new housing “right away” – likely in April – and complete the project by fall 2019. Correction, 6:33 p.m., March, 25, 2018: This article previously stated that the new student housing village would be composed of 23 interconnected buildings. The complex will have 25 interconnected buildings. The article has been updated to reflect this information.